“Detectives from the Metropolitan Police Department’s Homicide Branch have announced an arrest has been made in the homicide that occurred in the 200 block of Florida Avenue, Northeast (NOMA-Gallaudet Metro Station). On Saturday, July 4, 2015, at approximately 12:50 pm, officers on patrol from the Fifth District were alerted by Metro Transit Officers of a stabbing that occurred aboard a metro train in the NOMA-Gallaudet Metro Station, located in the 200 block of Florida Avenue, Northeast. Upon arrival, they located an unconscious adult male suffering from apparent stab wounds. DC Fire and Emergency Medical Services arrived on scene and found no signs of life. The decedent was transported to the Office of the Chief Medical Examiner for an autopsy. The decedent has been identified as 24-year-old Kevin Joseph Sutherland of Northeast, Washington, DC. 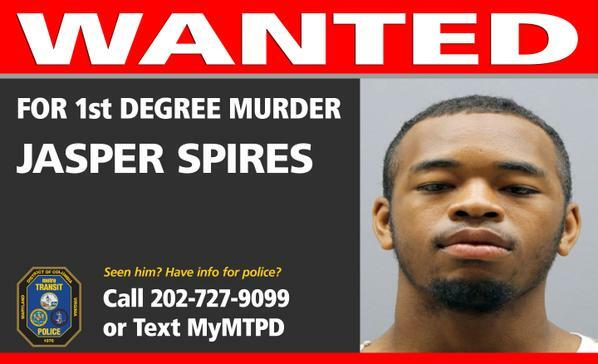 “Detectives from the Metropolitan Police Department’s Homicide Branch obtained an arrest warrant for Jasper Spires who is wanted for First Degree Murder While Armed for the stabbing death of 24-year-old Kevin Joseph Sutherland which occurred on Saturday, July 4, 2015, at approximately 12:50 pm, aboard a train approaching the NOMA-Gallaudet Metro Station, located in the 200 block of Florida Avenue, Northeast. If this subject is seen call 911 for immediate police response. Do not approach this person or attempt to apprehend him. “Detectives from the Metropolitan Police Department’s Homicide Branch are investigating the homicide that occurred in the 200 block of Florida Avenue, Northeast. On Saturday, July 4, 2015, at approximately 12:50 pm, officers on patrol from the Fifth District were alerted by Metro Transit Officers of a stabbing that occurred aboard a metro train in the NOMA-Gallaudet Metro Station, located in the 200 block of Florida Avenue, Northeast. Upon arrival, they located an unconscious adult male suffering from apparent stab wounds. DC Fire and Emergency Medical Services arrived on scene and found no signs of life. The adult male was transported to the Office of the Chief Medical Examiner for an autopsy.